In stock -This product will ship today if ordered within the next 12 hours and 37 minutes. 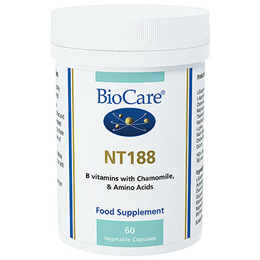 NT 188 is a synergistic blend of nutrients to help support the nervous system. Ideal for those under pressure in everyday life, it is particularly suitable for people with nerve rings in the iris. L-Glutamic Acid, Magnesium Gluconate, Capsule shell (hypromellose), L-Asparatic Acid, Chamomile (Matricaria chamomilla flower), Calcium Gluconate, Thiamine (as Thiamine Hydrchloride), L-Lysine Hydrochloride, Riboflavin, Anti-caking Agents (Silicon Dioxide and Magnesium Stearate), Niacin (as Niacinamide), Choline Bitartrate. Not suitable for use with antidepressants or mood modifying drugs such as Prozac and Valium. 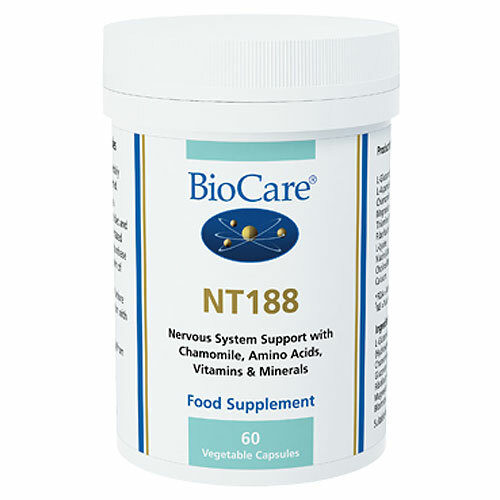 Below are reviews of NT 188 - Nervous System Support - 60 Vegicaps by bodykind customers. If you have tried this product we'd love to hear what you think so please leave a review.